I am one of the luckiest people I know as I get to wake up each day with a hubby that accepts my crazy career as a fun roller- coaster ride! When we first met I just started as a School Psychologist at the Delaware School School for the Deaf and then ventured in to teaching and interpreting with American Sign Language (ASL) which then led to my developing my company Signing Families™ and ultimately landed me on Learning and Laughter with Louise! WOW! So why do I pinch myself these days, especially on Wednesdays? I guess you can say because I never , ever, ever thought that the people whose talents I admired for years are the very people I now get to interview on Wednesday mornings. So, each Wednesday I pinch myself first thing in the morning as I know that my day will be filled with chatting about topics such as education, literacy, the entertainment industry, special causes (eg. JaylensChallenge.org, Mattieonline.com, TigerlilyFoundation.org, Yourshere.com ,for example) and so much more! My favorite part of this incredible journey is that I am able to bring quality guests to listeners each week who then share their amazing stories, invaluable educational information all while laughing and enjoying a cup of coffee with me! Do I have a favorite interview? Honestly- no. But, I do have favorite moments and today’s interview with American Idols previous contestants- John Stevens and Scott MacIntyre had some of those! John brought tears to my eyes while he discussed his love of Frank Sinatra. My parents use to dance around the house to the songs of Sinatra and many other great singers of this era. You can’t replace those memories. In addition, John sang on American Idol one of my favorites (As Time Goes By) by a top 5 movie in my book- CASABLANCA! 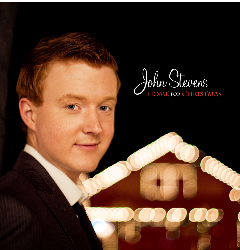 John is still very young and his amazing voice will no doubt continue to open many doors for him! Bravo to John! On the other hand, Scott had me laughing when he answered the following question- “If you could have a group of friends join you for a meal at your fave- Wolfgang Puck’s– who would be included? (Scott mentioned that he liked that this question was never one asked to him during an interview so he took a few moments to answer.) Here was his answer…. Scott immediately said Jack Black with a quick addition of Ben Stiller (never has met either). Then he added Bruce Hornsby (because of the many comparisons made of Scott and Bruce since Idol days). Followed by Billy Joel (admires his career and loves his music, which he has played during AI and on the tour). After a few more minutes (and I truly thought he would round out this fraternity with with Elton John) he shouted out….. FERGIE (from the Black Eyed Peas!) LOVED IT!! He did comment that a goal of his is to attend a live concert with Billy Joel and Elton John singing together. This top scholar turned musical artist will no doubt have that opportunity during his soaring career! Scott wanted to share that he is involved with the Idol Gives Back program and the finale that will air next week- so please check it out on FOX. John has many irons in the fire, including his involvement with the Beantown Swing Orchestra. 2. If YOU could invite 4-6 people to join YOU for a meal or a cup of coffee who would they be? Send me an email at info@Signingfamilies.com . Best answers will be read on air (maybe by YOU) and/or blogged. Please visit these sites, YouTube, etc. Of course go to http://toginet.com/shows/learningandlaughterwithlouise for more info.